Best Princess Doll Houses - So Beautiful and Enchanting! Which Delightfully Enchanting Princess Doll House Do You Like Best? Lots of little girls out there want to be a princess (especially after the whole Frozen phenomenon). With dollhouses and playsets that have princess themes, your child can enjoy hours of imaginary fun dreaming of Prince Charming and playing fairy-tale castle alone or with friends. Many children like to inject an element of fantasy into their play and love to role play and imitate real-life in their play scenarios. Princess dollhouses are an excellent way to combine these elements of fun for children. Fortunately, dollhouse manufacturers are well aware of the desires of children and this need is well catered for in the toy market. There is a great selection of different princess dollhouses available to suit children of different ages. They are also available in a variety of sizes and to suit different budgets. There are many princess doll houses to choose from. Here we’ve chosen the best to review to help you make a decision for your own little princess. This children’s dollhouse is based on Disney’s Beauty and the Beast animation. It is divided into four rooms over three levels with a central staircase between the ground and first floors. Designed for 12” dolls, this dollhouse also has two balconies and is beautifully decorated in a style that reflects the movie. The dimensions of the KidKraft Belle Enchanted Dollhouse are 19.9 x 30.8 x 46.2 inches and it weighs 31 pounds. Those who have bought this dollhouse say it is ideally suited for children between the ages of 3 and 8 years of age and it is perfect for children who love the Beauty and the Beast movie. Reviews of this product are, on the whole, extremely positive. Any complaints are typically about the assembly of the product. Specifically, that if screws are fastened too tightly the plastic cracks and that the staircase tends to fall off. However, the negative reviews are far outnumbered by positive feedback from consumers. This Frozen-themed dollhouse is beautifully decorated and boasts four rooms and a balcony over three levels. The dollhouse fits 12” dolls, such as Barbie and includes 11 pieces of furniture. This large dollhouse ideal for several children to play together. This Castle house is only suitable for children aged 3 years and over due to the small parts included. The dimensions of this dollhouse are 24.1 x 16.5 x 45.4 inches and it weighs 25.8 pounds. While most customers were delighted with their purchase, some people complained that this dollhouse is difficult to assemble. However, as a larger dollhouse for children, this is a common problem that is not specific particular to this specific model. The other main issue is that it does not come with dolls (see below) and you may need more furniture than what is included in the set. This means you need to think about further costs once you have bought this kids dollhouse. Overall, most customers report that their child has fallen in love with their dollhouse and they have played with it for hours. Doll set for Frozen Castle reviewed below…. 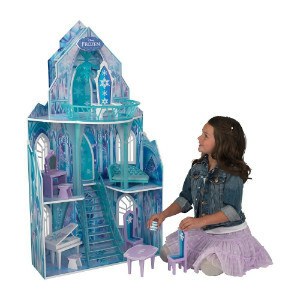 If you do need dolls for the KidKraft Disney Frozen Ice Castle Dollhouse, then this is the perfect set. 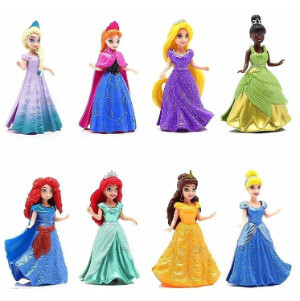 This eight-piece set includes eight different Disney characters that you can use with this dollhouse, any other house suitable for dolls of this size or for general play. The product dimensions are 18.2 x 10x 2.2 inches and the package weighs 1.2 pounds. The height of the dolls is 3.75”. Parents say that these dolls are the perfect accessory for a princess doll house. They provide their children with opportunities for creative play and they love interchanging the dolls’ outfits. The only negative comment about this product relates to how easily the clips come apart. This brightly colored folding dollhouse opens out to reveal five rooms over three levels. These include a ballroom, a music room, an observation tower, a kitchen and a parlor. The dolls house comes with two characters and there are five MagicPoint locations so the characters can interact with each other. Further characters are available. The dimensions of this dollhouse are 11.2 x 52.5 x 27.2 inches and it weighs 7.7 pounds. This is one of the best dollhouses for younger children as the manufacturers recommend this toy for children aged 18 months to 5 years. It is also one of the most technological and educational dollhouses available. There are many interesting features that encourage interaction and role play in young children. However, some customers have said the instructions are very poor and that the pieces are cheap and poor quality. This folding wooden dollhouse opens out and has a variety of rooms, turrets and stables over three levels. The characters included in the set are a king, a queen, a prince, a princess and two horses. 12 additional wooden accessories, including two thrones, are included in the set. 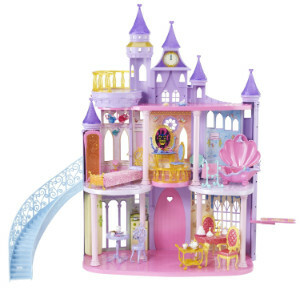 Of all the KidKraft dollhouses, this one is the best for children who adore princesses. The dimensions of this dollhouse are 18 x 17.5 x 21.2 inches and it weighs just under 13 pounds. The manufacturers recommend this product for children between the ages of 36 months and 15 years. However, it is probably best suited to children under ten years of age. It is a fantastic option for parents who struggle with assembly or find it frustrating and time-consuming because this item is pre-assembled. Parents who have bought this dollhouse think it is great and say their children love it. The one negative is that some customers have said some edges are unfinished. 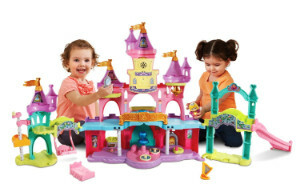 Brightly colored and fun, the Fisher-Price Little People Disney Princess Musical Dancing Palace is a fantastic dollhouse for girls. The dollhouse is split over two levels and features a ballroom, a balcony, turrets and a curved staircase connecting the two levels. There are spots on the dance floor for children to put their characters so they can dance. There are also songs, music and phrases. Belle, Cinderella and a Prince are included in the set. The dimensions of the product are 21.2 x 6 x 16 inches and it weighs just 1.3 pounds. This is a fun toy for younger children and has some excellent interactive features. However, the reviews for this dollhouse are somewhat mixed. While some people say it is an excellent and educational toy, others are disappointed in the poor quality and the limited number of songs and phrases. Inspired by scenes from some of Disney’s best-known movies, this fairy-tale castle is the typical vision of a princess castle from the eyes of a child. Designed in pretty pastel colors, this dollhouse is split into three levels and has five rooms and two balconies. The dollhouse folds neatly for storage as it has a hinged front and the sweeping, curved staircase gives dolls access to the upper levels. The dimensions of this dollhouse are 30 x 7.5 x 32 inches and it weighs 21 pounds. Despite this castle being one of the most visually appealing of the princess dollhouses on the market, there are many customers who are dissatisfied with this product. This is predominantly because of parts breaking easily or stopping working after just a short time. There are also complaints about some of the furniture not fitting in the rooms for which they are intended. On the other hand, there are a large number of customers who say their children love playing with this dollhouse and that the number of accessories included means their children never tire of playing with this toy. 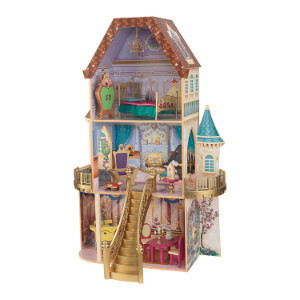 This Cinderalla dollhouse by Kidkraft has three floors with five rooms and two curved connecting staircases. Based on the story of Cinderella, this dollhouse boasts details related to this movie, such as a sewing room, a glass slipper and a pillow for Cinderella. The dollhouse is made from a range of sturdy materials, including solid wood, plastic and composite wood materials. There are also some details and accessories made from fabric. The dimensions of this Disney Princess doll castle are 38.5 x 14.8 x 58.7 inches and it weighs 32 pounds. While most parents say that their children are totally in love with this toy, there are two minor issues that are repeatedly mentioned in reviews. The first is that the stairs are not attached to the main dollhouse; they are simply propped against the ledge. The second is that the dollhouse is large and takes up a lot of space. However, the dimensions are clearly stated by the manufacturer so if you read the product information and ensure you have space at home, this should not be an issue. This hinged wooden castle dollhouse opens out to give three levels of play. The design features removable turrets, a working drawbridge, towers, arched walkways and balconies. It is possible to buy separate Melissa and Doug characters and accessories to complement this children’s dollhouse. 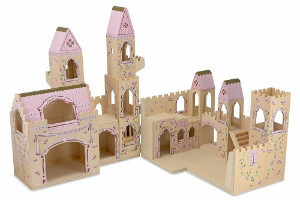 The Melissa & Doug Folding Princess Castle Wooden Dollhouse with Drawbridge and Turrets measures 17.5 x 27 x 15.2 inches and weighs 2.3 pounds. This is another dollhouse with mixed reviews. Some people love the simplicity of it and claim it sparks their child’s imagination. Others say it is the best gender-neutral dollhouse, despite the pastel-colored turrets. However, there are many complaints about the poor construction and the necessity of buying separate characters and accessories is a disappointment to many parents who have a limited budget. 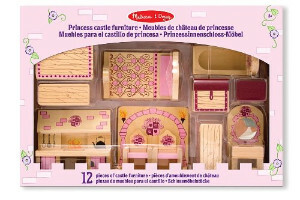 If you need further dollhouse furniture and accessories to match your Melissa & Doug Princess Castle Wooden Dollhouse, then these match perfectly. They are constructed of wood and the pretty details match the design of the castle. The product dimensions are 11 x 3.2 x 16 inches and the item weighs 1.4 pounds. If your child already has the Melissa & Doug princess castle or Medieval castle, then these items of dollhouse furniture are the perfect accessories. There are conflicting views on the size of the furniture. While some customers say it fits perfectly, others feel the size makes the rooms feel too cramped for easy play. 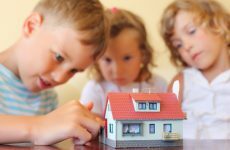 If you have a child who loves both princesses and dollhouses, then finding the perfect dollhouse to accommodate both these passions is easy as there is such a great choice on the market. Which you choose will depend on the age of your child, your budget, the space you have available and personal preferences. Some, such as the Fisher-Price Little People Disney Princess Musical Dancing Palace, are best suited to younger children. 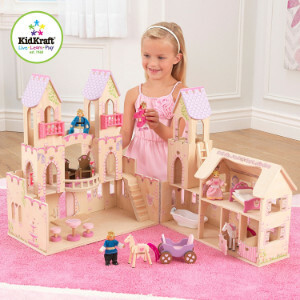 Others, such as the KidKraft Princess Castle Dollhouse with Furniture, have longer-lasting appeal and have the potential to see your child through from their toddler years to their teens. 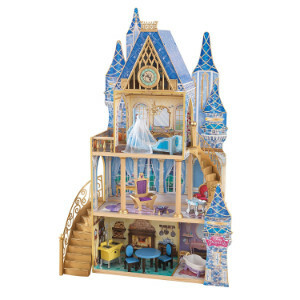 If the princess theme is the most important aspect of choosing the dollhouse, then the two best options are arguably the Disney Princess Castle or the KidKraft Disney Princess Cinderella Royal Dreams Dollhouse. However, each of these dollhouses has their own appealing features.